It seems like I make more cards with cats than dogs. 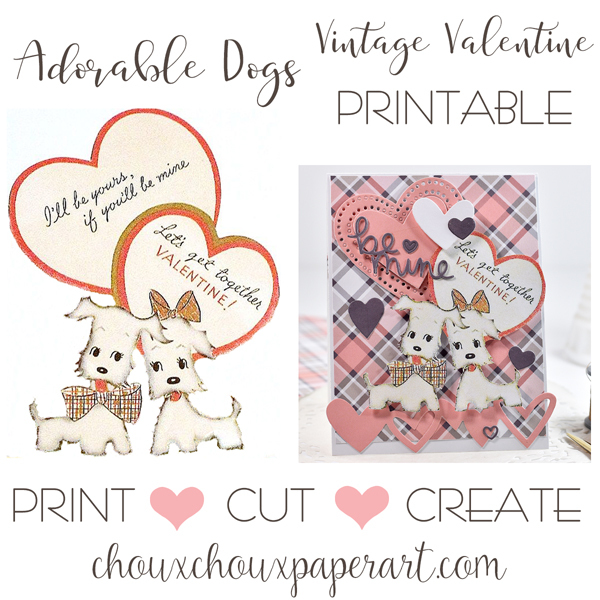 But these valentine dogs are adorable! So...I couldn't resist making a Valentine card with them. When Louisa saw them, she said,"Hi, Dog!" She says that a lot - every time she sees her dog, Percy, for sure. 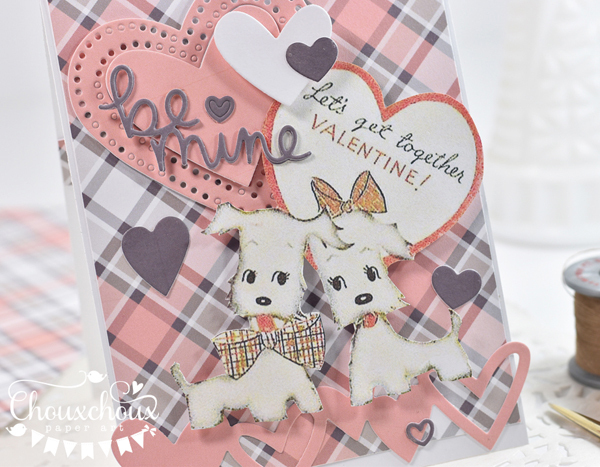 You can download the adorable dog valentine below. I love the layers on this card. The dogs are popped up, along with the middle of the large pink heart. Another layer is created by popping the white heart one layer above that. The base layer includes that beautiful plaid and few hearts in pink and brown. I guess you would call that brown - it's got a gray cast to it. Just a little strip of plaid and a heart to decorate the inside. Whether cats or dogs, adorable is what counts! What do you think? I could have titled this post: Pink Only! I've been in rather a pink mood. What does that mean? 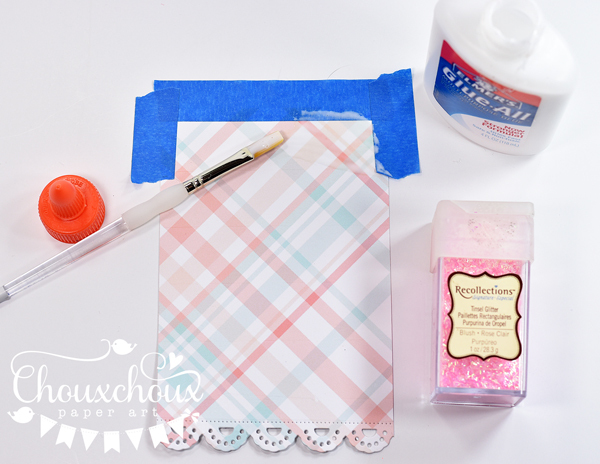 Cute, sweet, polka dots, and gingham, of course. Oh, and don't forget, glitter! First up is that adorable owl - winking right at you. I've had these pink gingham bags forever. I thought it was about time to use them and this owl made the perfect tag. She was so easy to make with my Cricut. 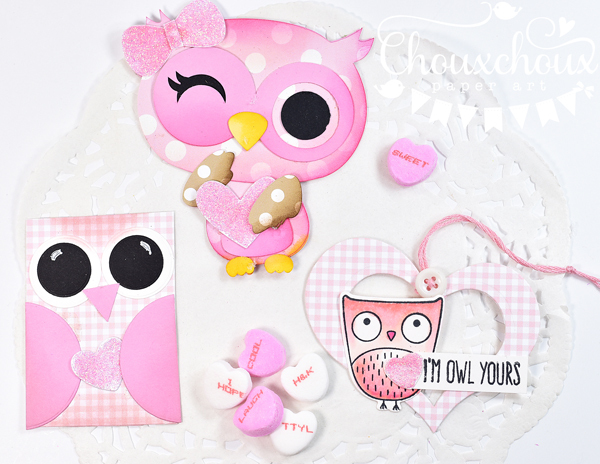 Love the pink and the wink! I haven't quite decided what package this heart shaped tag is going to decorate. I've had those heart dies forever too and hardly ever use them. And I think they're such a fun shape, so I don't know why I don't pull them out more often. 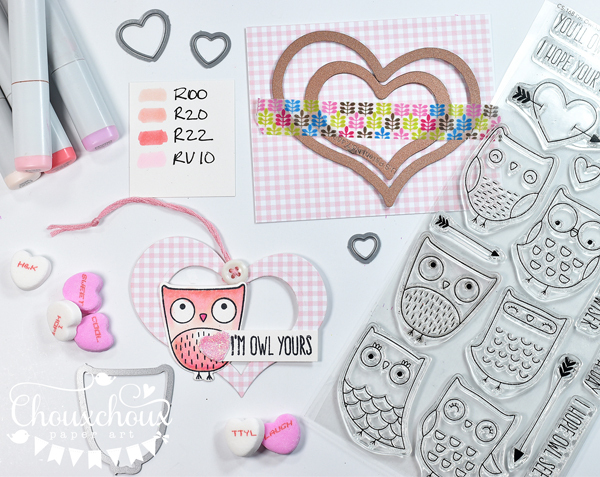 Whooo adores these little owl stamps? I do! Love the fun owl puns, too! Here are the pieces to the last owl tag. 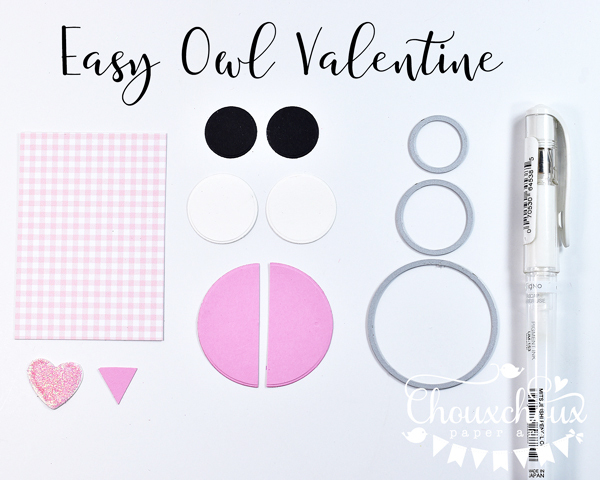 Easy is what this owl tag is - and cute, too. One tip I have for this owl, (it just seemed to make it sweeter) is to put the right eye just a little higher than the left. And add a little white to the eye. I poured some conversation hearts into a glassine bag and then folded the end over a little and then folded the bag in half. I wrapped the twine around and clipped on the owl. 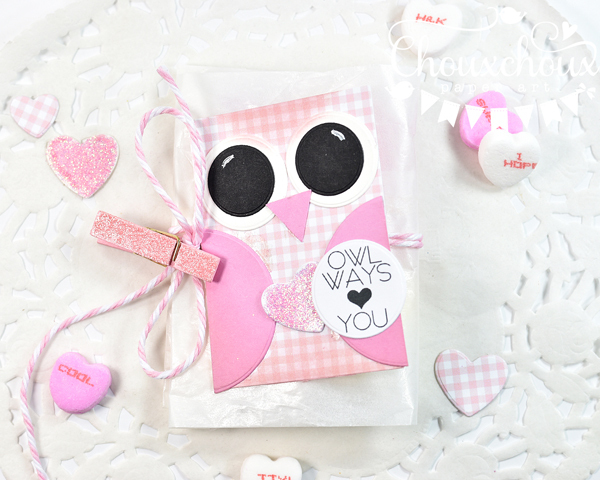 So that's three owl-ways fun owl Valentine tags. They certainly satisfied my pink mood. How about you? What color is your mood today? Hi, there! Oh my goodness, it's been a busy last few weeks. I wasn't able to create anything or even take photos of things I'd already made. We had to get totally new heating and air conditioning in our old 1909 house. New units, new ducts. What a mess! We had crews in our house for 3 weeks and dust and plaster bits everywhere. But, I also got to do something fabulous - we had Louisa here for 4 days. 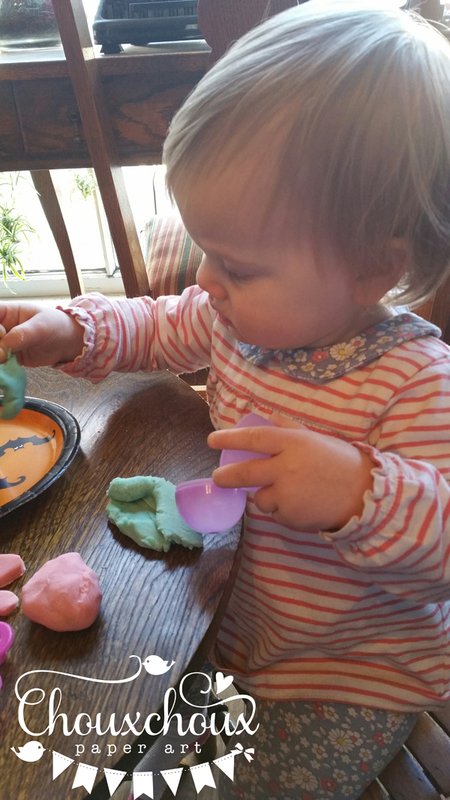 Here we are playing with homemade playdough, sitting at her mommy's old table and chairs. We got to be with her every day for over a week. Three days in Savannah, here for 4 days, and then back to Savannah for a couple of days. Complete joy! Our house seems to be missing a little something or I should say a little someone! I finally got started on Valentines. I've got to get busy, so I can get photos sent out to all my customers. 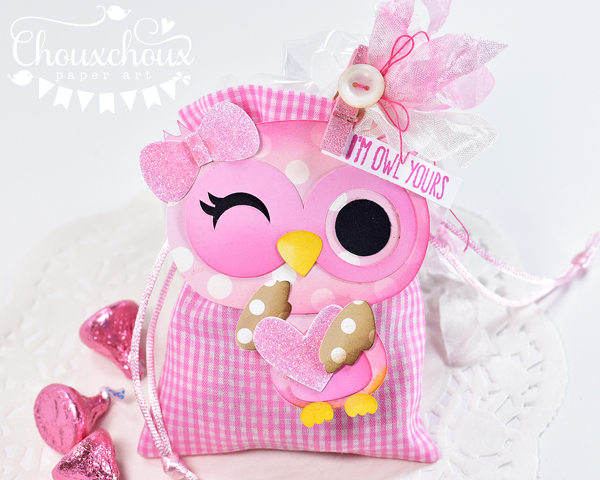 This one is designed for Louisa. One of her first words is "Rawr!" Totally adorable, shakes her head and growls. It started with a little tiny stuffed lion that her mommy would show her and roar. She started roaring and then would roar at lions in books. When we were leaving from OKC Airport, there was a huge banner for one of our local collages who's mascot is a lion. She saw it and "rawred" at the top of her lungs - seriously she was the hit of Will Rogers World Airport! Love this adorable lion. It's an old stamp from SandyLion. I love the paper too. It's not old - it's a new digital paper set. 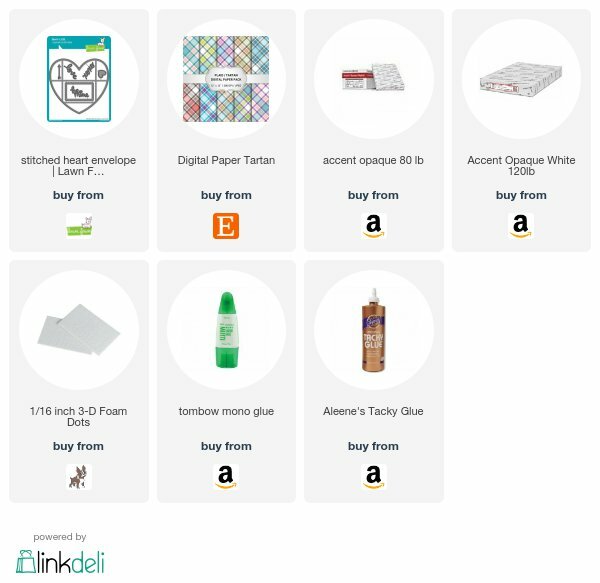 It's listed below in the supplies. I made an envelope from 22 lb copy paper with one of the patterns from the digital paper set and cut a heart from sticker paper to use for the closure. 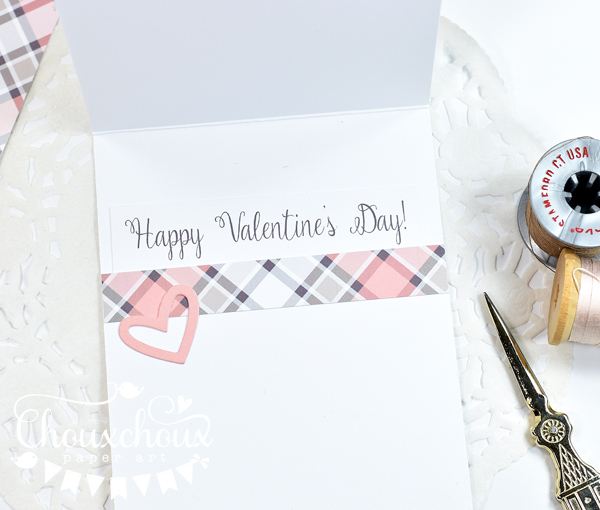 I adore this vintage valentine! I'm calling her French Valentine Girl. Who knows if she's French? I'm just going with the white wig being French... She's ready for you to download below. Of course, the background needed a little sparkle! She got the heart treatment as well as a panel (frame?) of tinsel glitter. 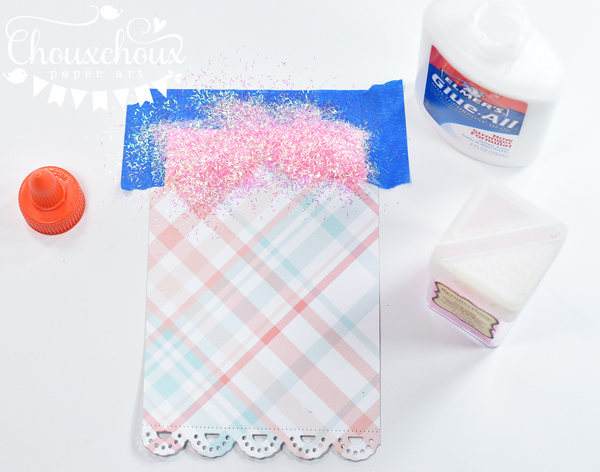 Super easy to create the panel of glitter. I really like using good old Glue-All and a paint brush for glitter. The glue's not too thick and all these years has worked beautifully. The blue tape helps with the straight lines. Just peel it off. 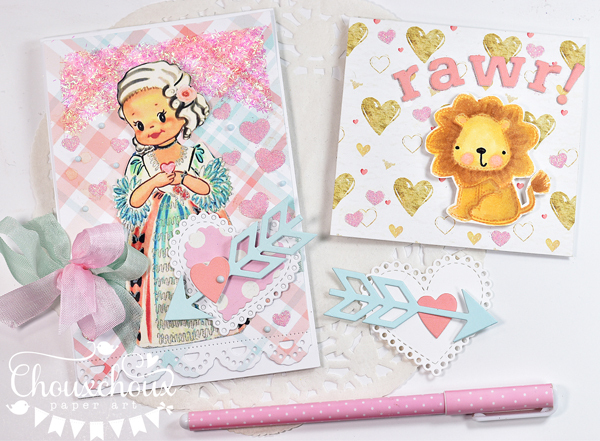 Next, I tried Stick It Adhesive sheets which is a great product for sticking intricate die cuts to cards. These hearts were so small that I couldn't get the backing off without ruining the delicate adhesive. Then I remembered my Be Creative Tape. The problem here is that it doesn't have release paper on both sides. I tried freezer paper and that worked pretty well, but I still had problems getting the release paper off without ruining the adhesive. So, what I finally did was adhere a regular piece of copy paper to the Be Creative Tape, die cut the hearts and glue the tiny hearts to the decorative paper, peel off the release paper and pour on glitter. It worked! Any other ideas? 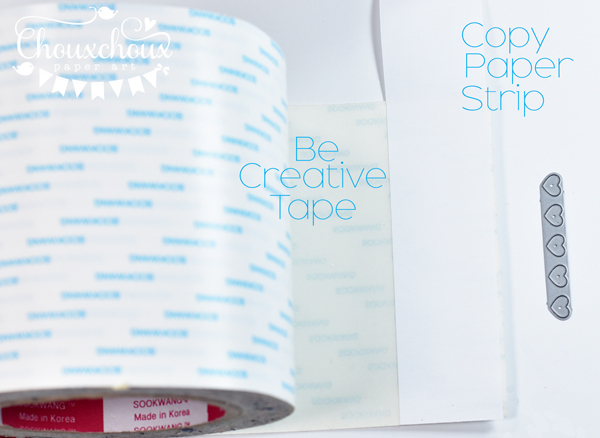 The Be Creative Tape is available in various sizes. 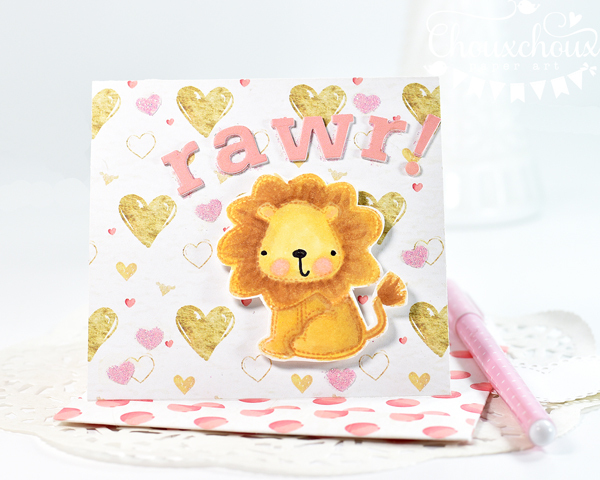 I've linked this size below (which is really too expensive), but Simon Says Stamp has all the other sizes, too. They have the sheets, too, which I think would be even better. 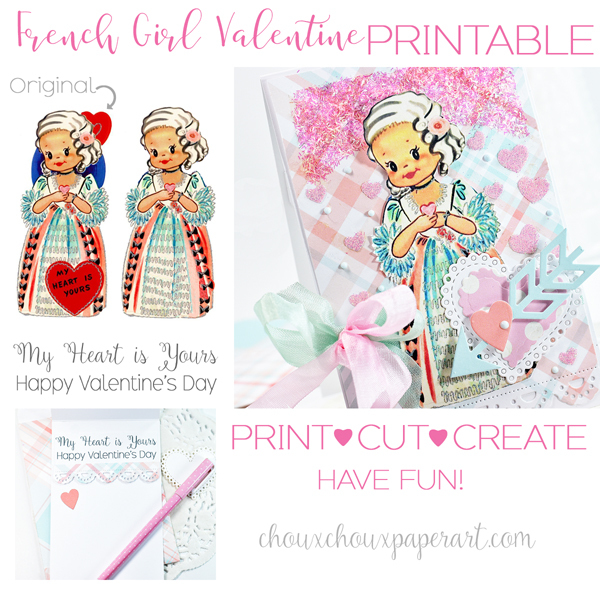 Download French Valentine Girl HERE. I guess I'll have to post my Christmas projects throughout the first part of 2018. I also know that I've promised a video from Visions of Sugarplums and I'll get on that too. Hope you had a wonderful Christmas and a Happy New Year!